Marischal College in Aberdeen, one of the largest, and finest, granite buildings in the world, has been restored to the ‘Silver City’s’ skyline once again, after a major £40 million redevelopment by Holmes Architects. 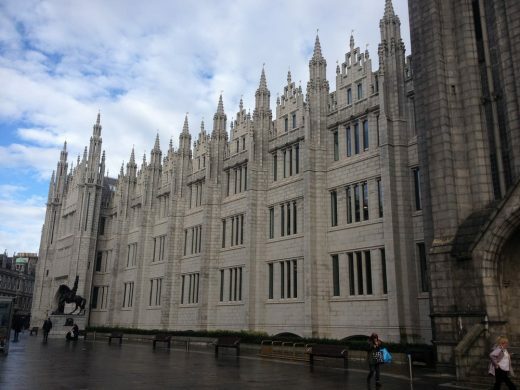 Following the successful completion of a two-year long restoration and upgrade, the soaring silver-white granite landmark has re-emerged as the new HQ for Aberdeen City Council. 1400 staff in total, from various council premises around the city, are due to move into the building over the coming months. At 400ft long and 80ft high, Marischal College is the world’s second largest granite building after El Escorial Palace in Madrid. 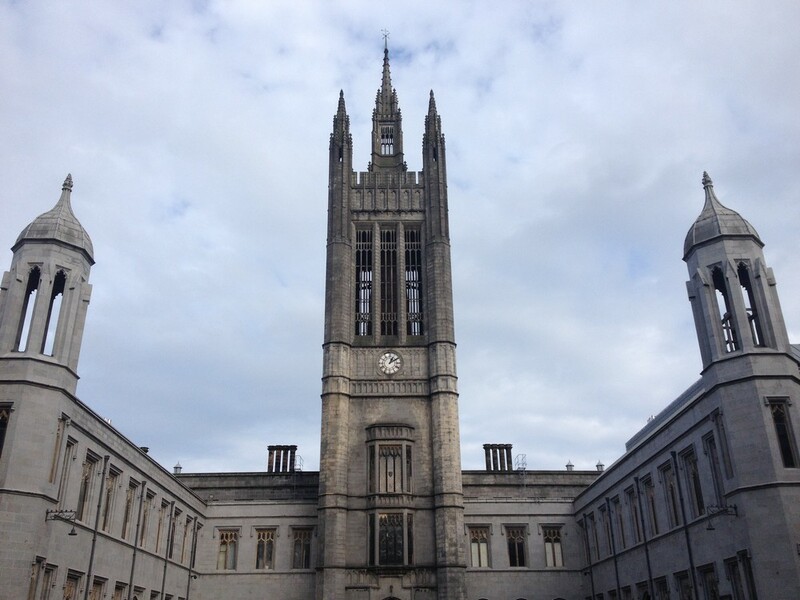 The former University of Aberdeen building was constructed at a time when Aberdeen was exporting more granite than it was using on its own buildings. Built in two stages, the first, a three-sided quadrangle in a stiff Tudor Gothic style with tracery windows and smooth granite ashlar finishes, was designed by Archibald Simpson in 1841. The second stage, by London based Alexander Marshall Mackenzie, is believed to have been influenced by Charles Barry’s designs for the Houses of Parliament, one of the most prominent examples of secular gothic architecture in Britain. Mackenzie’s addition saw Greyfriars Church removed to create a grand frontage on to the city’s Broad Street with Simpson’s original entrance tower extended to create a prominent city centre landmark. 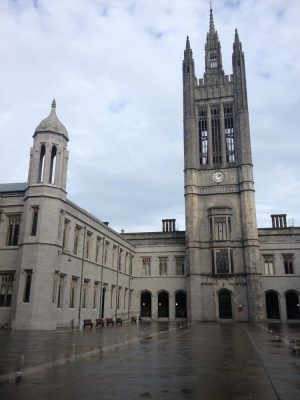 Having remained empty for a number of years, Aberdeen City Council made the decision to develop it as its headquarters, and appointed Holmes Architects to lead the restoration and upgrade in 2007. The first stage of the two-year construction, which came in on time and on budget, saw a lengthy process of façade retention, a strip out of most of the internals, and the reconfiguration of granite stonework. Given the ‘A’ listed status of the building every removed stone was accounted for and every process scrutinised. Many of the building’s unique historical features have been restored. These include: the oak panelled Senate Rooms (now the city’s main civil wedding venue); the granite entrance pend; large-scale leaded glass windows; and the North West tower. 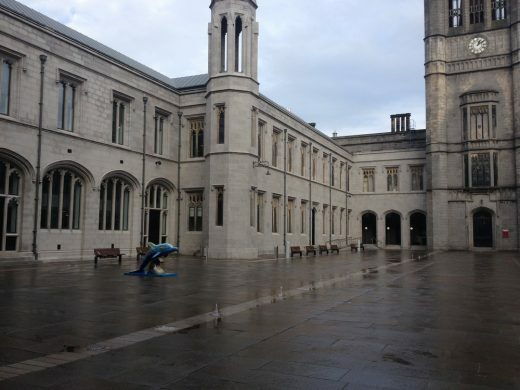 The grand central collegiate style quadrangle, formerly used as a car park, has been reinstated as a key civic space by means of high quality Caithness and granite landscaping, and a central processional route from Broad Street through the reinvigorated Marischal College complex. This central route is highlighted with two rows of specialist lighting bollards and computer-controlled fountains that will operate in pattern and are lit from below with LED coloured lighting. Internally, in order to make the building viable to any form of business, it was necessary to maximise the usable floor space. As a result two extra floors have been added by reconfiguring the floor levels and installing new roof level accommodation, clad in natural zinc that blends with the granite masonry. The roof edge details have been carefully worked out to minimise the visual impact of the new structure above the existing masonry parapets. Towards the North Wing of the building the floor plate becomes too deep for sufficient light penetration. Subsequently, roof lights and a full height void have been inserted to allow a shaft of light deep into the heart of the building. This atrium space accommodates two rebuilt windows at either end taken from the original building, which creates a focus for views and a reminder of the existing building exterior. In terms of materials, the primary interior spaces adjacent to the entrance, the Reception and Customer Services Centre, are characterised by white lined walls, Kemnay granite flooring and granite detailing to add texture and context. A range of booths and desks has also been designed to help streamline the daily workings of the Council and the people they serve, aiming to create a pleasant, stress-free experience. An extensive cleaning process was carried out on the granite building to remove over 100 years of dirt and pollution. Crucially, all granite used in the fabric of the building is indigenous, with the project securing the last of the granite stockpiled from the local Kemnay quarry. 90% of the 4,200 tones of demolition material were also recycled, and in terms of sustainability the completed building has received an Excellent BREEAM rating. Building Services Engineer: Wallace Whittle Ltd. The building was handed over to the client in June 2011 and opened to the public shortly thereafter. An official opening is due to take place in the near future. Holmes Architects was formed sixty years ago and has established a reputation for delivering innovative and intelligent solutions across all sectors. With offices in Glasgow and Edinburgh, Holmes Architects works with clients across all sectors, including healthcare, residential, commercial, education, industrial, and justice. Current workload includes major residential regeneration projects; city centre and business park commercial developments; and an extensive school building programme for local authority clients. In November 2011 Holmes Architects forged a new architectural practice, with another of Scotland’s longest established and well recognised firms, The Miller Partnership, to form a fresh national practice with a growing portfolio of international projects. Reflecting the strong brand name of each firm the new practice will retain the names of the original founders and is now known as Holmes Miller. Each practice has a strong UK workload, with recent awards of significant public and private projects in the UK, China and India. The values ‘Dedicated, Open & Creative’ will continue to be at the core of the new business.